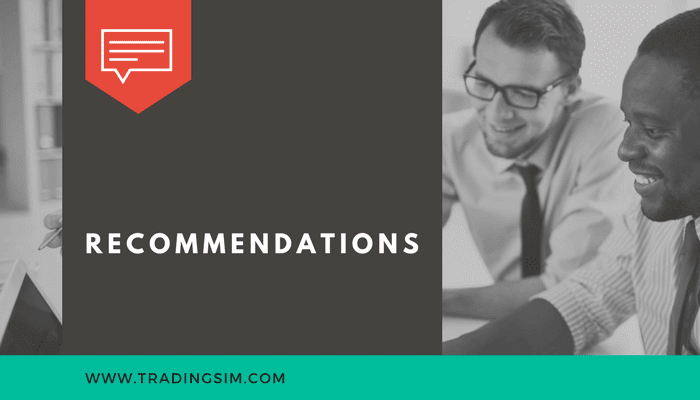 Today, we will cover 5 trading strategies using the indicator and how you can implement these methodologies within your own trading system. Beyond the strategies, we will explore if the MACD is appropriate for day trading and how well the MACD stacks up against moving averages. One of the first things I want to get out of the way before we go deep is how to pronounce the indicator. There are two ways you can pronounce MACD. The first is by spelling out each letter by saying M - A - C - D. The next is by saying "MAC" D. In order for the trading community to take you seriously, these are the sorts of things we have to get right off the bat! Now, let's dig into the content. Chapter 1: What is the MACD? Chapter 2: What are the Correct MACD Settings? 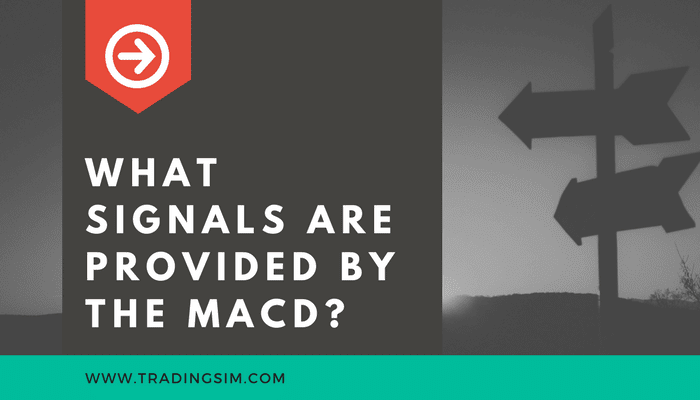 Chapter 3: What basic signals are provided by the MACD? 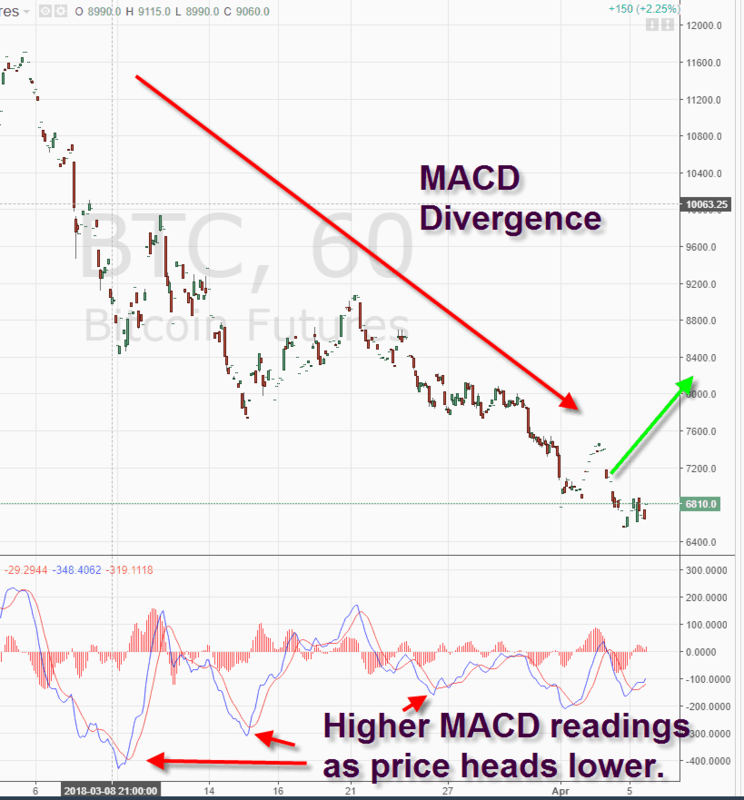 Divergence - Does a Difference in the MACD and Price lead to trend reversals? 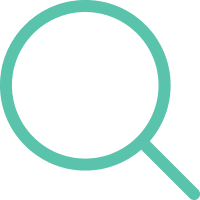 Chapter 5: Is MACD appropriate for Day Trading? The moving average convergence divergence calculation is a lagging indicator used to follow trends. It consists of two exponential moving averages and a histogram. The default values for the indicator are 12,26,9. It is important to mention many traders confuse the two lines in the indicator with simple moving averages. Remember, the lines are exponential moving averages and thus will have a greater reaction to the most recent price movement, unlike the SMA. The MACD line itself is calculated as follows 12-period EMA - 26 period EMA. This period will represent the time period of your choosing (i.e. 5-minute, 60-minute, daily). 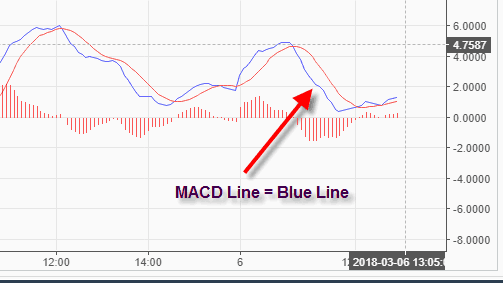 The MACD calculation generates a smoothed line as depicted by the blue line in the chart below. 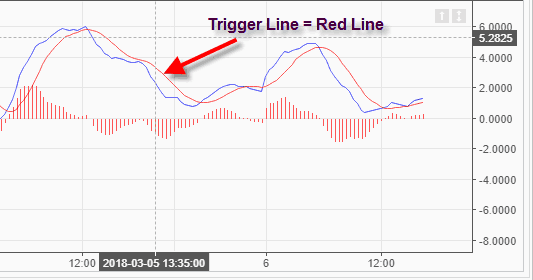 Next up is the red line in the chart, is most commonly referred to as the trigger line. The red line is the 9-day EMA of the MACD line. This may sound a little confusing, but it's simply an average of an average. This 9-EMA is then plotted on the chart with the MACD line. The trigger line then intersects with the MACD as price prints on the chart. To learn more about how to calculate the exponential moving average, please visit our article which goes into more detail. The last component of the MACD is the histogram, which displays the difference between the two EMAs of the indicator (12 and 26). Thus, the histogram gives a positive value when the fast EMA (12) crosses above the slow EMA (26) and negative when the fast crosses below the slow. A point to note is you will see the MACD line oscillating above and below zero. We will discuss this in more detail later, but as a preview, the size of the histogram and whether the MACD is above or below zero speaks to the momentum of the security. 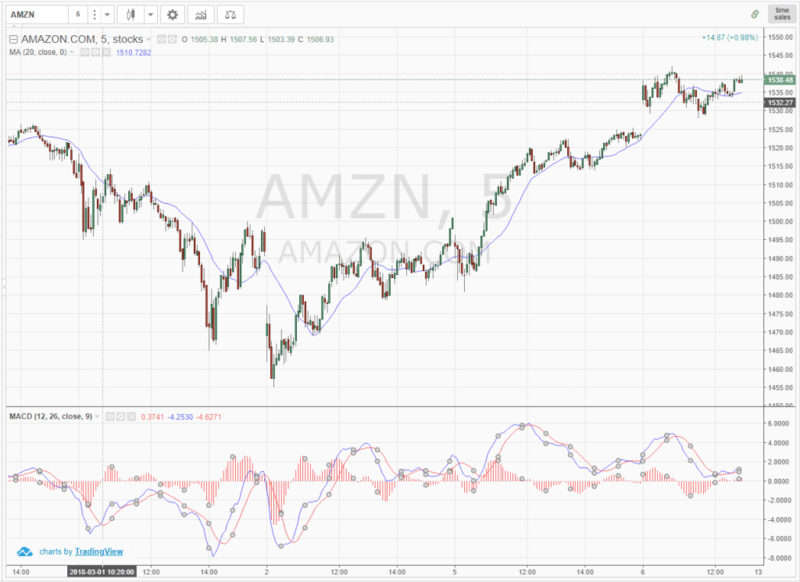 Here is a chart of Amazon with default MACD settings applied. What would happen if we were to lower the settings on the trigger line to a shorter period? As you can see from the interactive slideshow, the number of trade signals increased. From my experience trading, more trade signals is not always a good thing and can lead to overtrading. On the flip side, you may want to consider increasing the trigger line period, so you can monitor longer-term trends. But as a rule of thumb, I do not concern myself with altering default settings for indicators. This can lead down a slippery slope of analysis paralysis. You have likely heard of the popular golden cross as a predictor of major market changes. Well, when it comes to the MACD we don't need such a significant crossing to generate valid trade signals. The most important signal of the moving average convergence divergence is when the trigger line crosses the MACD up or down. This gives us a signal that a trend might be emerging in the direction of the cross. Have you ever heard of the quote "The Trend is Your Friend"? Well, the MACD firmly believes in this old adage. What I personally like about the MACD is the indicator has a built-in filter for trade signals. This filter is easy to apply to any chart. If the MACD is below the zero line, do not open any long positions when the trigger line crosses above the MACD line. Conversely, if the MACD is above the zer0 line, do not open any short positions when the trigger crosses below the MACD line. There it is my friend, you got it? To further illustrate this point, let's check out a chart of Bitcoin. Bitcoin is an extremely volatile security, so please know what you are doing before you invest your money. At any rate, notice how the MACD stayed above the zero line during the entire rally from the low 6000 range all the way above 11,600. Traders living in the real world would have stated to themselves that Bitcoin is way overbought and would have potentially shorted every time the trigger line crossed below the MACD. This approach would have proven disastrous as Bitcoin kept grinding higher. What would have kept you out of this nonsense of shorting, only to be squeezed later? That's right, you should ignore sell signals when the MACD is above zero. If you see price increasing and the MACD recording lower highs, then you have a bearish divergence. Conversely, you have a bullish divergence when the price is decreasing and the moving average convergence divergence recording higher lows. Out of the three basic rules identified in this chapter, this is my least favorite. Not that it doesn't work, it's just you can receive multiple divergence signals before price ultimately shifts. Therefore, if your timing is slightly off, you could get stopped out of a trade, right before price moves in the desired direction. This is a one-hour chart of Bitcoin. The selloff in Bitcoin has been brutal since early March. As the price of Bitcoin has continued lower, the MACD has made higher highs. Divergence may not lead to an immediate reversal, but if this pattern continues to repeat itself, a change is likely around the corner. Since the MACD has no upper or lower limit, traders do not think of using the tool as an overbought/oversold indicator. 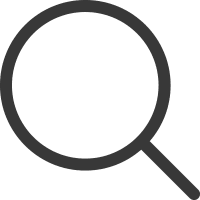 To identify when a stock has entered the overbought/oversold territory, look for a large distance between the fast and slow lines of the indicator. 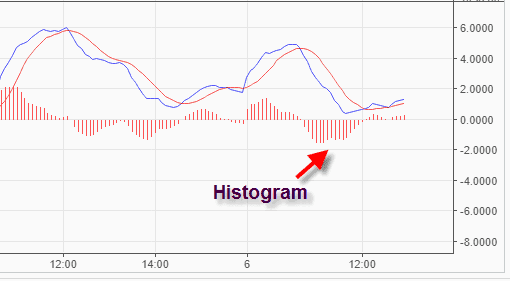 The easiest way to identify this divergence is by looking at the height of the histogram on the chart. This divergence can lead to sharp rallies counter to the preceding trend. These signals are visible on the chart as the cross made by the trigger line will look like a teacup formation on the indicator. Again, the MACD has no limits, so you need to apply a longer look back period to gauge if the security is overbought or oversold. To illustrate this point, let's take a look at the S&P 500 E-mini Futures contract. Let me ground you on a few things before we go any further. First, I selected the S&P 500 E-mini contract because the security is less volatile and has consistent price moves. This will help reduce the extreme readings of the MACD. Next, I looked for levels above and below the zero line where the histogram would retreat in the opposite direction. This is where using the MACD as an overbought/oversold indicator gets tricky. At any given point, a security can have an explosive move and what historically was an extreme reading, no longer matters. If you decide to use the MACD as a means to gauge overbought/oversold areas, you must adhere to strict stops. Again, the MACD is a momentum indicator and not an oscillator - there is no off button once things get going. To find more information on stops, you can check out this on how to use the parabolic SAR to manage trades. The indicator's sole purpose is to provide stop protection when in a trade. 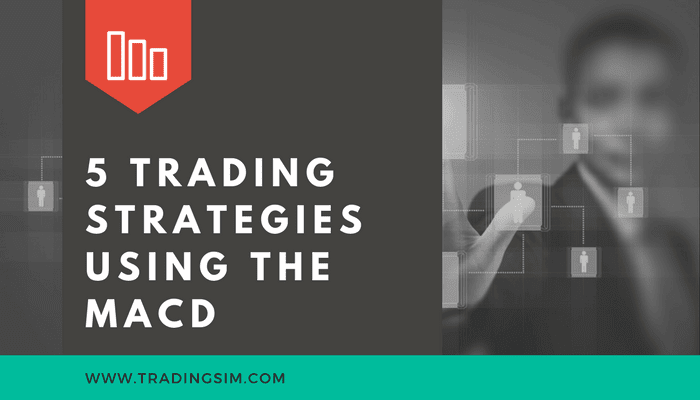 Now that we understand the basics of the MACD indicator, let's dive into five simple strategies you can test out. I have decided to take the approach of using less popular indicators to see if we can uncover a hidden gem. Feel free to stress test each of these strategies to see which one works best with your trading style. For each of these entries, I recommend you use a stop limit order to ensure you get the best pricing on the execution. Why the RVI? The RVI is an oscillator that focuses on a security's closing price to its price range. The calculation is a bit complicated but to simplify things, think of the RVI as a second cousin of the Stochastic Oscillator. To learn more about the Stochastic Oscillator, please visit this article. By adding an oscillator in the mix, it will provide greater context of overbought/oversold conditions, while the MACD will confirm if the momentum or strength of the trend is intact. The basic idea behind combining these two tools is to match crossovers. In other words, if one of the indicators has a cross, we wait for a cross in the same direction by the other indicator. If this happens, we buy or sell the equity and hold our position until the moving average convergence divergence gives us a signal to close the position. This is the 60-minute chart of Citigroup from Dec 4-18, 2015. It shows two short and one long position, which are opened after a crossover from the MACD and the RVI. These crossovers are highlighted with the green circles. Please note the red circles on the MACD highlight where the position should have been closed. From these three positions, we would have gained a profit of $3.86 per share. Next up, the money flow index (MFI). The money flow index is another oscillator, but this oscillator focuses on both price and volume. 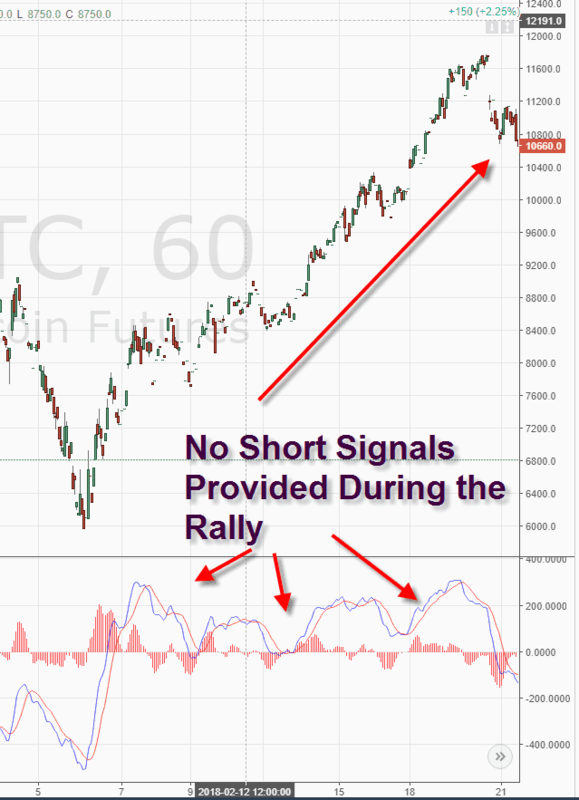 The MFI will generate less buy and sell signals compared to other oscillators because the money flow index requires both price movement and surges in volume to produce extreme readings. 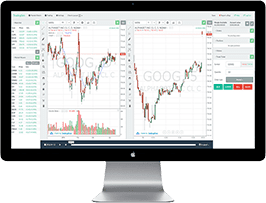 In this strategy, we will combine the crossover of the MACD with overbought/oversold signals produced by the money flow index (MFI). When the MFI gives us a signal for an overbought stock, we will wait for a bearish cross of the MACD lines. If this happens, we go short. It acts the same way in the opposite direction – oversold MFI reading and a bullish cross of the MACD lines generates a long signal. This is the 10-minute chart of Bank of America. The first green circle highlights the moment when the MFI is signaling that BAC is oversold. 30 minutes later, the MACD has a bullish signal and we open our long position at the green circle highlighted on the MACD. We hold our position until the MACD lines cross in a bearish direction as shown in the red circle on the MACD. This position would have brought us profits of 60 cents per share for about 6 hours of work. Entering the ring, the Triple Exponential Moving Average (TEMA) indicator! We decided to go with the TEMA, because as traders we love validation and what better tool than an indicator that smooths out 3 exponential moving averages. We also went with 50-periods to capture the bigger moves to reduce the number of trade signals provided with this strategy. Trade signals are generated when the fast line crosses the MACD and the security price breaks through the TEMA. We will exit our positions whenever we receive contrary signals from both indicators. This is the 10-minute chart of Twitter. In the first green circle, we have the moment when the price switches above the 50-period TEMA. The second green circle shows when the bullish TEMA signal is confirmed by the MACD. This is when we open our long position. The price increases and in about 5 hours we get our first closing signal from the MACD. 20 minutes later, the price of Twitter breaks the 50-period TEMA in a bearish direction and we close our long position. This trade would have brought us a total profit of 75 cents per share. To learn more about the TEMA indicator, please read this article. Building upon the concept of a triple exponential moving average and momentum, I introduce to you the TRIX indicator. The TRIX is a nice pairing with the MACD because it is an oscillator, but more importantly, it is a momentum oscillator. To learn more about the TRIX, please read this article. This time, we are going to match crossovers of the moving average convergence divergence formula and when the TRIX indicator crosses the zero level. When we match these two signals, we will enter the market and await the stock price to start trending. This is the tighter and more secure exit strategy. We exit the market right after the trigger line breaks the MACD in the opposite direction. This is a riskier exit strategy because if there is a significant change in trend, we are in our position until the zero line of the TRIX is broken. Since the TRIX is a lagging indicator, it might take a while for that to happen. This is the 30-minute chart of eBay. The first green circle shows our first long signal, which comes from the MACD. The second green circle highlights when the TRIX breaks zero and we enter a long position. The two red circles show the contrary signals from each indicator. Note in the first case, the moving average convergence divergence gives us the option for an early exit, while in the second case, the TRIX keeps us in our position. 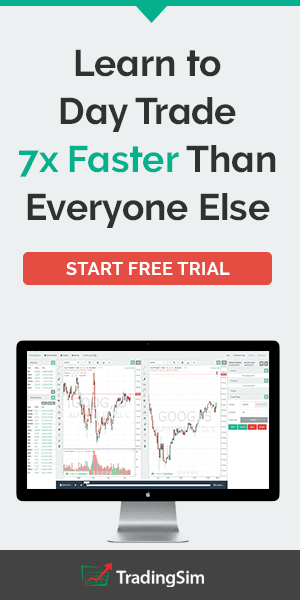 Using the first exit strategy, we would have generated a profit of 50 cents per share, while the alternative approach brought us 75 cents per share. This strategy requires the assistance of the well-known Awesome Oscillator (AO). For those unfamiliar with the awesome oscillator, is obviously an oscillator, but it's an oscillator without boundaries. It's simply the difference of a 5-period simple moving average and a 34-period simple moving average. To learn more about the awesome oscillator, please visit this article. We will both enter and exit the market only when we receive a signal from the MACD, confirmed by a signal from the AO. This is the 60-minute chart of Boeing. The two green circles give us the signals we need to open a long position. After going long, the awesome oscillator suddenly gives us a contrary signal. Yet, the moving average convergence divergence does not produce a bearish crossover, so we stay in our long position. The first red circle highlights when the MACD has a bearish signal. The second red circle highlights the bearish signal generated by the AO and we close our long position. Furthermore, notice that during our long position, the moving average convergence divergence gives us a few bearish signals. Yet, we hold the long position since the AO is pretty strong. This long position would have brought us a profit of $6.18 per share. I often get this question as it relates to day trading. The simple answer is yes, the MACD can be used to day trade any security. The MACD is based on whatever time frame you are trading. Therefore, it's effectiveness or lack thereof is has nothing to do with intraday trading versus daily charts. 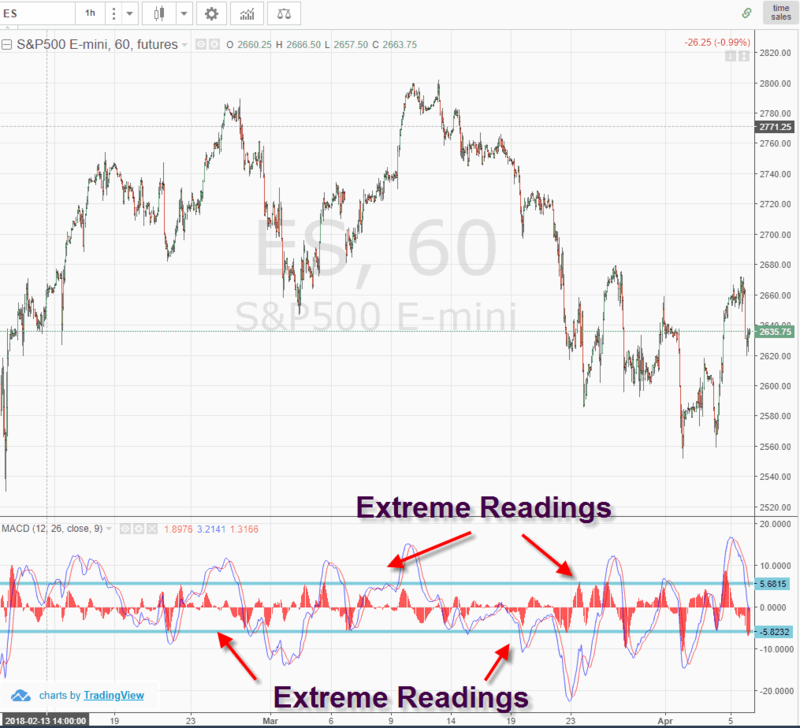 The one thing you should be concerned about is the level of volatility a stock or futures contract exhibits. The greater the volatility, the less likely the MACD or any other indicator for that matter will accurately forecast price movement. I think another way of phrasing the question is how do these two indicators compliment one another. You can use the moving average as a means to validate the price move with the MACD. In the below trading example of the S&P500 E-mini futures, notice how the contract performs as it approaches the 20-period moving average. A simple strategy is to wait for the security to test the 20-period moving average and then wait for a cross of the trigger line above the MACD. This simple strategy will allow you to buy into the pullbacks of a security that has strong upward momentum. I hate to report I had a tough time finding the best MACD book. Most books I could find on Amazon were self-published. There was no obvious MACD evangelist like John Bollinger with Bollinger Bands, so if you are looking to dominate the space - now is the time. 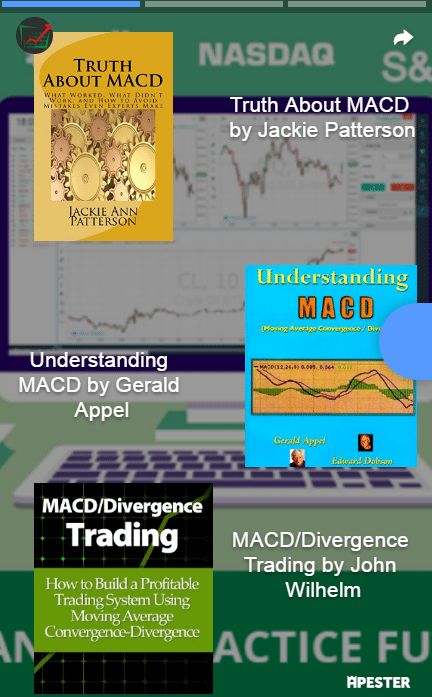 The best information on MACD still appears in chapters in popular technical analysis books, or via online resources like the awesome article you are reading now. 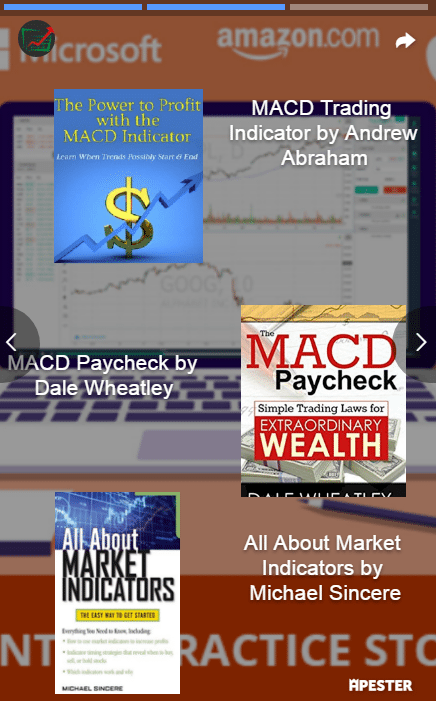 At any rate, I want to be as helpful as possible, so check out the below carousel which has 10 MACD books you can check out for yourself. Whatever time frame you use, you will want to take it up 3 levels to zoom out far enough to see the larger trends. For example, if you are using a 5-minute chart, you will want to jump up to the 15-minute view. Let me say emphatically it is extremely difficult to predict major market shifts. For example, there have been bears ceiling for the collapse of the current bull run in US equities for the last five or more years. Now that I have provided my disclaimer, let's look at the sell-off in early 2016 with the S&P500 E-mini Futures. The E-mini had a nice W bottom formation in 2016. Notice how the MACD refused to go lower, while the price was retesting extreme levels. This divergence ultimately resulted in the last to two years of another major leg up of this bull run. 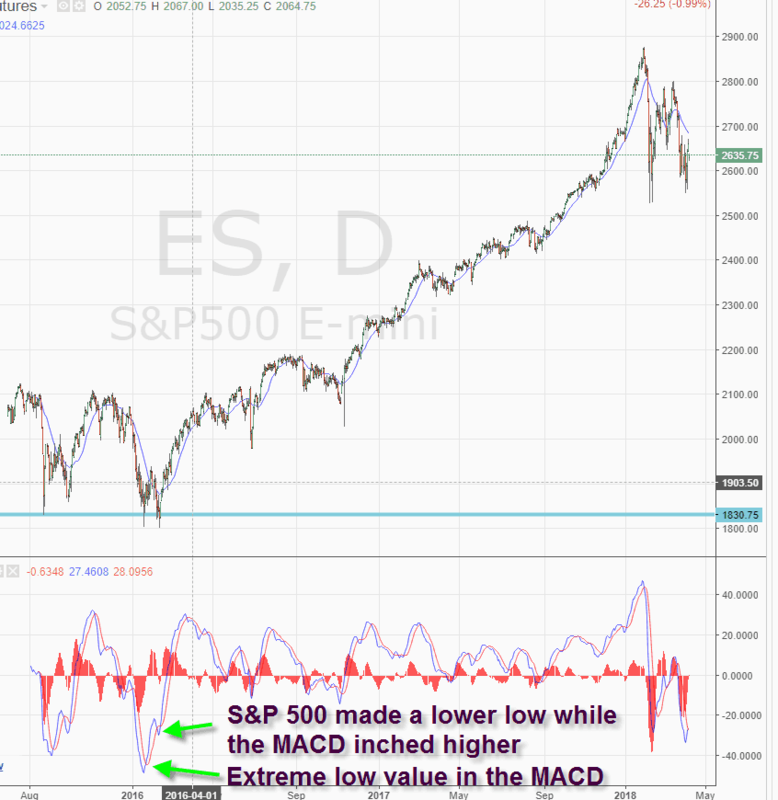 The key to forecasting market shifts is finding extreme historical readings in the MACD, but remember past performance is just a guide, not an exact science. I prefer combining my MACD indicator with the Relative Vigor Index or with the Awesome Oscillator. The reason is the RVI and the AO do not diverge greatly from the moving average convergence in terms of how these indicators react to price movement. For this reason, the RVI and the AO are less likely to confuse you, yet provide the necessary confirmation to enter, hold or exit a position. The TEMA also falls in this category, but I believe the TEMA could get you out of the market too early and you could miss extra profits. Regrettably, I find the MACD + TRIX indicator strategy too risky. Yet, it could be suitable for traders with a greater appetite for risk. All things considered, the Money Flow index + MACD generates many fake signals, which we clearly want to avoid. Independent of these 5 strategies, my personal favorite is the bonus strategy, which combines the MACD with the 20-period moving average. The indicators in this study best paired with the moving average convergence divergence indicator are the simple moving average, RVI and AO. External Link - create the moving average convergence divergence formula in excel. This one is for all you bookworms that need to see exactly how the indicator works.